Loretta Chapel Fribourg, foto Pierre Rossier. tilhører V.& A. kilde HER. Om det lille CDV er af samme fotograf - skulle man tro, men helt ens er optagelserne ikke. Rossier returned to Switzerland in early 1862 and, in October 1865, married Catharine Barbe Kaelin (1843–1867). The couple had a son, Christophe Marie Pierre Joseph, who was born on 30 July 1866. Catharine died on 4 April 1867. Rossier maintained a photographic studio in Fribourg until at least 1876 and he also had a studio in Einsiedeln. 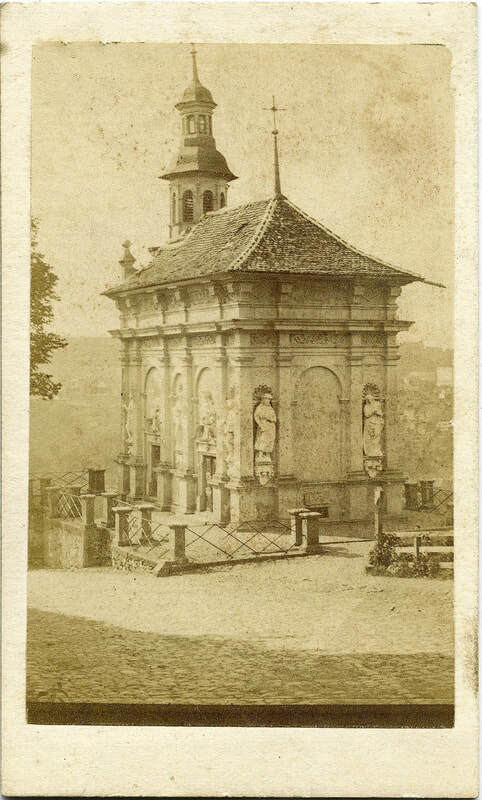 During the 1860s and 1870s, he produced a number of stereographs and cartes-de-visite comprising portraits and views of Fribourg, Einsiedeln and other places in Switzerland. An 1871 advertisement in the French-language Fribourg newspaper La Liberté offered photographs by Rossier of religious paintings by the artist Melchior Paul von Deschwanden. In 1872, Rossier applied for a passport to travel to France where he may have produced photographs. Pierre Joseph Rossier (1829 – 1898) was a pioneering Swiss photographer whose albumen photographs, which include stereographs and cartes-de-visite, comprise portraits, cityscapes, and landscapes. He was long thought to be from France and while he was in Japan he was even referred to as an “Englishman”; however, recent research has revealed that Rossier was Swiss, born in Grandsivaz, a small village in the Canton of Fribourg. At some point after leaving Switzerland and arriving in England, Rossier was commissioned by the firm of Negretti and Zambra to travel to China to photograph the Second Opium War (1858–1860). It may be that the firm considered Rossier’s Swiss citizenship an asset for such a voyage, that his country’s neutrality might help him find passage aboard either British or French ships. Taking into account the high costs and uncertainty incurred by the firm and the potential hazards for Rossier himself, this was an important commission. Rossier was in Hong Kong in 1858, and he soon began taking photographs, mostly in and around Canton (now Guangzhou). 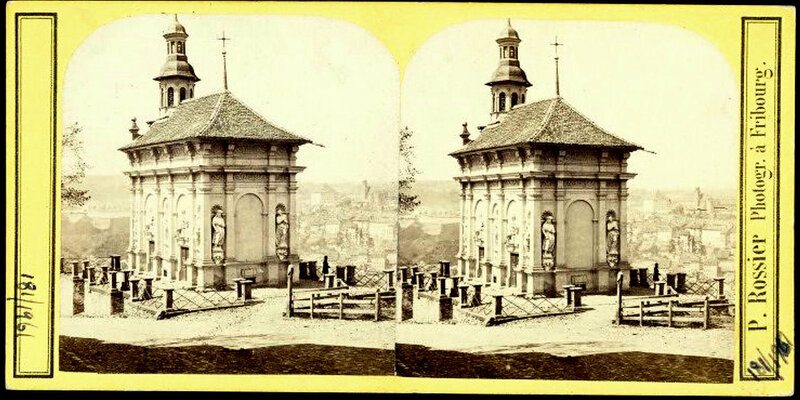 In November 1859 Negretti and Zambra published a set of fifty of Rossier’s views, including stereographs. These received favourable reviews in photographic periodicals of the day. In 1858 or 1859 Rossier travelled to the Philippines where he visited and photographed the Taal Volcano. Rossier was in Japan by 1859, producing photographs first in Nagasaki, then in Kanagawa, Yokohama and Edo (now Tokyo); he was the first professional photographer to arrive in Japan. One of the photographs Rossier took during the summer of 1859, while in Nagasaki, was a portrait of Philipp Franz von Siebold’s son Alexander and a group of samurai from the Nabeshima clan. At the end of June 1860, Rossier was in Shanghai, and it is likely that he visited the city in an attempt to gain permission to accompany the Anglo-French military expedition that had already arrived in northern China and thereby fulfill his commission to document the Second Opium War. If so, he was unsuccessful; both forces had already hired photographers to document the mission. The British forces were accompanied by the photographers Felice Beato and John Papillon, and the French by Antoine Fauchery, Lieutenant-Colonel Du Pin, and possibly also by Louis Legrand. Although Rossier failed even to embark on the mission he had been hired to document, he remained in East Asia for some time longer. By October 1860, Rossier had returned to Nagasaki, where he took photographs of the harbour on behalf of the British Consul, George S. Morrison, for which Rossier was paid $70. Although Rossier’s photographs of Japan were advertised by Negretti and Zambra on at least two occasions in 1860, the firm did not publish them until October or November 1861. Five of Rossier’s views of Japan appeared earlier, in George Smith’s book, Ten Weeks in Japan, in April 1861, and that July, eight of Rossier’s Japan photographs appeared in the form of lithographs in Henry Arthur Tilley’s book, Japan, the Amoor, and the Pacific. An 1861 edition of the Illustrated London News included several engravings under the collective title Domestic Life in China, the images having been taken from Rossier’s stereographs. One of the photographs Negretti and Zambra had advertised in 1860 became the first commercial photograph taken in Japan to be published, and is the earliest known hand-coloured Japanese photograph. Thanks to a number of documents of the time, it is now certain that Negretti and Zambra’s photographs of China and Japan were taken by Rossier, but for many years it was thought that they might have been taken by either Walter B. Woodbury, who also had dealings with Negretti and Zambra but was based in Batavia (now Jakarta), or Abel Gower, who was an amateur photographer in Japan. Interestingly, the Leiden University photograph collection includes a portrait, allegedly of Gower, signed “P. Rossier”, and in 1859 Rossier and Gower shared passage aboard HMS Sampson from Nagasaki to Edo.